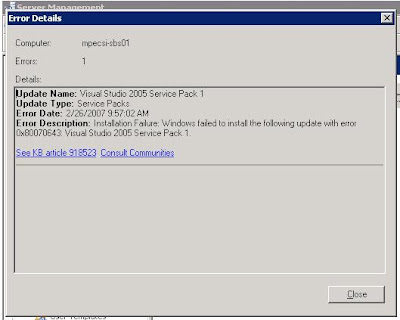 Installation Failure: Windows failed to install the following update with error 0x80070643: Visual Studio 2005 Service Pack 1. Wowzers! A whole 432 MB download! No wonder WSUS choked. Might not be the reason, but it sure could be. Then on to KB925336: Error message when you try to install a large Windows Installer package or a large Windows Installer patch package in Windows Server 2003 or in Windows XP: "Error 1718. File was rejected by digital signature policy"
Download it, run the install, and all should be good! What a pita this update is! The first time I tried to apply, the Win2003 server did a blue screen of death. Rebooted and tried again, and the installation worked. The web page of work around isn't quite accurate. I had to run the middle step first of "control admintools" before being able to set the registry key described in the initial instructions. Eventually muddled through it. Anything but a clean service pack install. I need to update this post with the digital signature information. Every one of my installs choked at that point.